This is how your translator will look like. When someone clicks on the Translate button, translation option will appear. After clicking the down arrow, a drop down list of language will open. To enable translation for your site, you've to add the following code in your HTML. Copy and paste the above code in your site's HTML where you want this widget appear. This code works with almost any platform. You can also customize this code. Look at the green texts. The first one is Dark. Dark looks fine when your site's background is light. But if your site is dark, then use Light instead of dark. The next one is Manual. That means someone needs to translate the page manually using the widget. But if you use the word Automatic, then your page will be automatically translated depending on the browser language! The last one is en. That means your site is in English - en. If your site's language is something else then you've to use the code of that language. For example, ar for Arabic, da for Danish, fr for French. Visit Translator Widget to see the codes for other languages. You can also change the background color of the widget using the color attribute. Sign in to your blogger account and then go to your site's dashboard/ settings. Now go to the Layout option from the left pane. Choose Add a Gadget from anywhere (I prefer right sidebar). Now copy and paste the Translator Code in the Content box. Save the gadget and view your site. Now when someone will translate your site, it will be translated within a second. And original text will also be displayed if you move your mouse over the text. To back to the original text, you have to cross the translator widget. 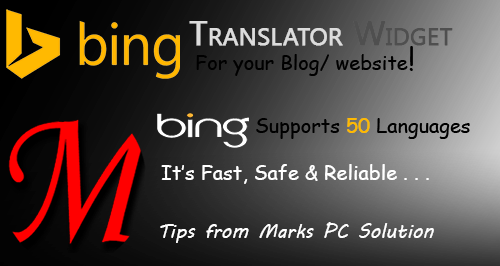 Hi i have use the bing transltor for my translation work but in that many language we didn't get for example if we talk for asian language they are not there so i prefer for google translation we many language even though i appreciate that you have written the blog thanks for giving information. Ya you're right. But I hope bing will be better gradually. And also another thing I wanted to tell you is that you are earning with 360 ads. When ever you post a software or any thing then keep its download link at end, above that 360 download button. That will increase your earning as this is the best way to earn from 360 adds. It's okay but I don't like to bother my visitor. I always focus on visitor's conveniecne. why Microsoft does not want to make the application blog as blogger and wordpress? You mean a blogging platform by Microsoft?